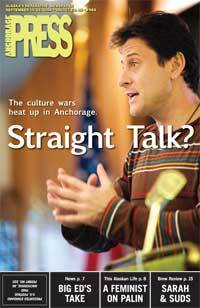 The Anchorage Press, wrote a large feature story on the so-called “ex-gay” ministries. It did so after TWO and local Alaskan activists squared off against Focus on the Family, which brought its “ex-gay” road show to town last week. TWO Executive Director, Wayne Besen, flew to Alaska to help organize a response. The anti-gay symposium took on national interest after GOP Vice Presidential nominee Sarah Palin’s house of worship – the Wasilla Bible Church – promoted the event. Besen spoke at the Anchorage Metropolitan Community Church with local clergy and mental health experts to counter Love Won Out. Thanks to E. Ross of the website Bent Alaska and Edie Bailey of the Metropolitan Community Church and PFLAG, there was a powerful response to the “ex-gay” road show.